7:52 PM – Officers responded to the 1300 blk. of CR 772 about a burglary in progress. Officers arrived on location and secured the residence. The point of entry was a window on the east side of the residence. There were two rifles taken from the residence. No suspects at this time. Case pending. 7:52 PM – Officer responded to IH-35 and FM 471 bridge about a white male walking on the bridge looking like he wanted to jump. Officer arrived in the area and searched the area well and was unable to locate the male subject. 11:15 AM – Officer responded to the Special Education room on 8th St. and Pearson St. about a theft of soft drinks. Officer spoke to the teacher and she stated she had two Cokes in her refrigerator before she left the room and two students were in the room when she got back. She noticed the two Cokes were missing and questioned the students, but the students denied taking the beverages. 4:18 PM – Officer observed a white male subject walk onto a residence in the 200 blk. of Miller St. and take a bicycle without the owner’s consent and take off on it down the road. Officer immediately responded and detained the male subject at the intersection of Miller and Hwy. 132. Officer informed the male subject he was under arrest for theft of property and was going to the Medina County Jail. The theft carried a Class B misdemeanor offense. 6:00 PM – Officers responded to the 2400 blk. of Hwy. 132 about a disturbance between a man and wife. Officers spoke to the male subject and he stated he and his wife are going through a separation and had an altercation about who got the kids. There were no charges filed at this time on any parties. 9:35 AM – Officer responded to the area of FM 471 and FM 463 about a male and female disturbance, but was unable to locate the couple. 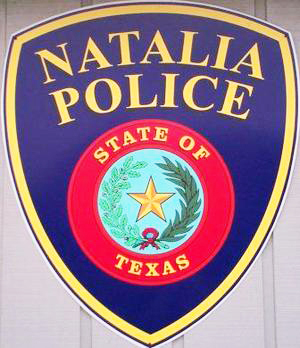 10:27 AM – Officer responded to Natalia High School to meet with the principal and talk about a theft that occurred in one of the 5th period classes. Officer and the principal both spoke to the 5th period class about the theft. 11:00 AM – Officer responded to the 100 blk. of 4th St. to assist EMS with a lift assist on a patient. Officer completed the task and went back in service. 5:47 PM – Officer received a call from a Time Warner dispatcher about a person in a red vehicle trying to get someone to bring illegals across the border for $9,000 each at Love’s Truck Stop. Officer went and patrolled the area and was unable to locate any red vehicle. 12:11 AM – Officer responded to the 700 blk. of 4th St. about a vehicle that had blood on it. Officer made contact with the registered owner, and he advised the officer that his girlfriend’s brother-in-law assaulted him with a pistol, hitting him on the head and then taking his car without permission. The offense was reported to the Medina County Sheriff’s office. 9:37 PM – Officer responded to Dollar General about a male subject looking into cars in the parking lot. Officer caught up with a male subject fitting the description at the corner of FM 471 and 8th St. The male subject was later arrested for public intoxication.